Paris St-Germain missed the opportunity to secure their second successive French title after only managing a draw at relegation-threatened Sochaux. PSG knew a win would make it impossible for second-placed Monaco to catch them with three games left. Laurent Blanc's men led when Uruguay striker Edinson Cavani put them ahead before half-time. Thiago Silva is the third player to score more than one own goal in Ligue 1 this season after Reims pair Anthony Weber and Aissa Mandi. But skipper Thiago Silva's own goal after the break put their title celebrations on hold. PSG, who are eight points clear of Monaco, will wrap up the league on 7 May if Claudio Ranieri's side fail to beat Guingamp. 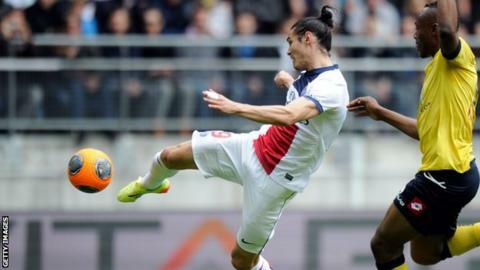 "The trouble is that people think it's a done deal,'' PSG coach Blanc said after Sunday's draw. "The more people say it, the more we also believe it. "I know we haven't won the league yet. There's not much missing but we still miss that little something." Former Manchester United and Tottenham striker Dimitar Berbatov scored twice to help Monaco crush bottom club Ajaccio 4-1 on Saturday to keep the title race alive. But even if Monaco beat Guingamp next week, PSG will still secure the trophy if they beat Rennes later on the same day. The Parisians' triumph last season, with the help of ex-England captain David Beckham, was their first Ligue 1 title since 1994. Match ends, Sochaux 1, Paris Saint Germain 1. Second Half ends, Sochaux 1, Paris Saint Germain 1. Attempt blocked. Sébastien Corchia (Sochaux) right footed shot from outside the box is blocked. Sébastien Roudet (Sochaux) wins a free kick in the attacking half. Substitution, Sochaux. Abdoulrazak Boukari replaces Jordan Ayew. Attempt blocked. Cédric Bakambu (Sochaux) right footed shot from the left side of the box is blocked. Assisted by Sanjin Prcic. Attempt missed. Nathan Sinkala (Sochaux) right footed shot from outside the box is close, but misses to the right. Assisted by Jordan Ayew. Attempt saved. Javier Pastore (Paris Saint Germain) right footed shot from outside the box is saved in the bottom right corner. Assisted by Marco Verratti. Sébastien Corchia (Sochaux) wins a free kick in the defensive half. Gregory Van der Wiel (Paris Saint Germain) wins a free kick in the defensive half. Foul by Cédric Bakambu (Sochaux). Substitution, Paris Saint Germain. Javier Pastore replaces Lucas Moura. Sébastien Roudet (Sochaux) wins a free kick in the defensive half. Attempt blocked. Sanjin Prcic (Sochaux) right footed shot from outside the box is blocked. Attempt missed. Stoppila Sunzu (Sochaux) header from the centre of the box is too high. Assisted by Sébastien Roudet with a cross following a corner. Corner, Sochaux. Conceded by Blaise Matuidi. Attempt blocked. Edinson Cavani (Paris Saint Germain) left footed shot from outside the box is blocked. Assisted by Ezequiel Lavezzi. Attempt missed. Edinson Cavani (Paris Saint Germain) left footed shot from the centre of the box is high and wide to the left. Assisted by Lucas Moura. Substitution, Sochaux. Cédric Bakambu replaces Roy Contout. Attempt missed. Sébastien Corchia (Sochaux) right footed shot from outside the box is too high. Assisted by Roy Contout. Attempt missed. Jordan Ayew (Sochaux) header from very close range is too high. Assisted by Sébastien Roudet with a cross. Foul by Alex (Paris Saint Germain). Cédric Kanté (Sochaux) wins a free kick in the defensive half. Corner, Paris Saint Germain. Conceded by Yohann Pelé. Attempt saved. Marco Verratti (Paris Saint Germain) right footed shot from the centre of the box is saved in the centre of the goal. Assisted by Gregory Van der Wiel. Attempt missed. Lucas Moura (Paris Saint Germain) right footed shot from outside the box misses to the left. Assisted by Thiago Motta. Attempt missed. Nathan Sinkala (Sochaux) right footed shot from outside the box is close, but misses to the left. Assisted by Sébastien Corchia. Attempt saved. Edinson Cavani (Paris Saint Germain) right footed shot from the centre of the box is saved in the centre of the goal. Assisted by Lucas Moura. Florian Marange (Sochaux) wins a free kick in the defensive half. Corner, Paris Saint Germain. Conceded by Julien Faussurier. Attempt missed. Sanjin Prcic (Sochaux) left footed shot from outside the box is close, but misses to the left. Assisted by Jordan Ayew. Substitution, Paris Saint Germain. Marco Verratti replaces Yohan Cabaye.